The rustic wood top of this console table brings texture and warmth to any living room. 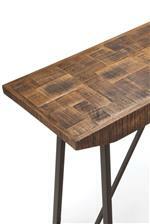 The top is crafted from mango wood with a weathered texture and parquet pattern top. The base features angular iron legs in a dark finish, a perfect use of mixed materials. 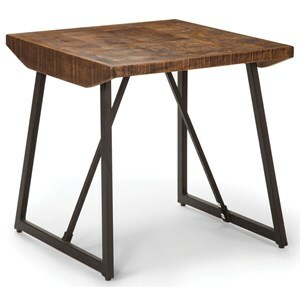 The Walden Rustic Industrial Sofa Table with Parquet Pattern Wood Top at Morris Home in the Dayton, Cincinnati, Columbus, Ohio, Northern Kentucky area. Product availability may vary. Contact us for the most current availability on this product. A little edgy but totally cozy, this collection of living room tables is so on-trend. The look is modern industrial, reminiscent of your favorite coffee shop or restaurant. 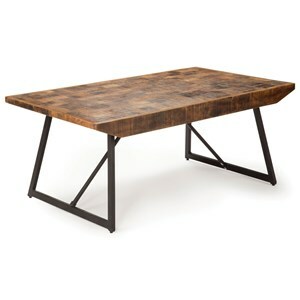 Modern shapes get a vintage make-under in textural, rustic mango wood and dark iron. The Walden collection is a great option if you are looking for Global Industrial furniture in the Dayton, Cincinnati, Columbus, Ohio, Northern Kentucky area. Browse other items in the Walden collection from Morris Home in the Dayton, Cincinnati, Columbus, Ohio, Northern Kentucky area.